Recently, I had the honor and privilege to meet Rev. Don Southworth, the current Executive Director of the Unitarian Universalist Ministers Association (UUMA), at the Spring Minister’s Retreat for the Heartland Chapter of the UUMA. This is my first year as a “regular member” and not a student member of the UUMA, and through the hectic pace of ministerial formation I had not attended many UUMA events in other chapters… not a lack of interest, just a lack of time. Seminary is time consuming enough even before you add military chaplain candidacy, hospice and hospital residency, and founding and administering an outreach ministry with Navy basic trainees. Don gave us an excellent presentation on the future plans and vision of the UUMA, including an enticing description of the plans for the next Center Institute event, as well as other continuing education programs. He shared some of the UUMA’s long-ranged planning, and some of the transitions that have occurred since he became the Acting Executive Director. We discussed the resources that are being developed for ministers serving as Good Offices, as well as guidance for chapters. I agreed with the sentiment expressed by more than one of my ministerial colleagues at the event… that for the first time in awhile I have been excited by the activities of the UUMA. I want the UUMA to be a Union as much as a Professional Association. One of the benefits of my years as a traveling preacher on issues of war and peace (among others) is that I have contacts in a lot of UU Congregations. At last count I have preached in over 45 churches, and though that number has not grown significantly this year (between my congregation and the military, I’m already preaching every weekend), such travel preaching has long been a part of who I am. Also, many congregations know me through this blog, and have contacted me to ask permission to present one of my sermons in their Sunday morning worship. Recently, I’ve become aware of several congregations considering making offers to ministers who are not Fellowshipped by the UUA, and are not members (regular or associate) of the UUMA. In some cases these ministers were not even in the transfer process with the MFC. Often, they are individuals who are connected to the congregation when a ministerial transition occurs, and the congregation makes the choice, for a variety of reasons, to call or contract with them instead of enter into the search process. In one case, the person who was telling me about this over the phone was very excited by how their congregation was considering “bucking the system” and “standing up to the UUA” by considering calling a non-UU minister. Knowing this person to be something of an activist, I asked them if they supported unions. “Of course, I’ve marched with them for years” they replied. In another case where I did not make the point so blatantly, I asked a former member of the congregation I am now serving why their congregation was considering doing the same… “well, there are some financial reasons…” I bit my tongue, but what I wanted to say was that this was the same excuse the Governor of Wisconsin was using. I’m not going to get into all the reasons why ministers need a union. They are wide and varied, and they are complicated by the reality that most congregations and congregants have very little understanding what a life of ministry entails. Rev. Dr. Lisa Presley, the Heartland District Executive of the UUA, has an excellent program on “The Care and Feeding of Ministers” that names this reality for congregations in ways that I think address the disconnect in understanding. I hope to get a group of Michigan congregations together to see the presentation sometime this summer (if you are interested, email me). I also want to say that the UUMA already does some of the work of being a Union. We hold our members accountable and to a standard. We work with the UUA (the association of congregations) on guidelines for benefits and salary. We advocate within the institutional structures for our ministers. What I would like to see is us making the case to congregations as to why they need to call UUMA members as their ministers. Why fair compensation and equitable benefits for our ministers is not just a good idea, but a necessity for healthy, balanced ministries… and to live the values we so often express. I would love to see the UUMA not just engage in continuing education for or ministers, but continuing education and advocacy with our congregations for, as Lisa put it, “The Care and Feeding of Ministers”. And, I would like to see the UUMA actively advocate for congregations to call ministers who are members of the UUMA… and engage in focused conversations with congregations who are considering doing otherwise. In short, I want to know that a Union has my back. As someone who in my professional writing life writes about labor from time to time, and who has a strong belief in the role of collective bargaining in bringing about a more just society, I like the way you think here. Indeed, I think what you suggest is a model for a revitalized unionism in general. Alas, so much has to be done to rehabilitate the concept of unions that it may be a steep uphill battle. The wars against them going on in Wisconsin, Michigan, Ohio and elsewhere would not have been possible without decades and decades of erosion of the legitimacy of unions and collective bargaining in the public mind — some of it abetted by unions themselves, but much of it from the relentless and still persisting efforts of moneyed interests. I’ve seen this happen, literally in my own backyard. I like what you say here so much – and have much to say on the subject from personal experience. However, discretion prevents me from broadcasting it in such a public forum. So let me just say a loud AMEN – and I hope we can discuss this issue in person some time. I’m all for fair treatment of ministers. I agree that many congregants and congregations have little real idea of the amount of work that goes into ministry. My concern is that unionized ministers might infringe seriously on our congregational polity. After all, for a union to work it must threaten non-compliers with penalties. I’ve never had an interest in being bossed around by the UUA and don’t want to get bossed around by some ministers’ association either. Will a ministers’ union work to get congregations kicked out of the UUA if they call their own preferred ministers? Or only call a half- or quarter-time minister? Will they penalize ministers who preach at such churches, abrogating our centuries-old practice of free pulpit exchange? Will they force all UU ministers to pay dues to the association, just as my wife is forced to pay dues to the union at her workplace? Historically there have been two different kinds of unions – industrial unions and craft uions. Craft unions are in many ways a modern version of guilds – keeping wages up by keeping out non-members, and setting up hoops to jump through to become a member. Industrial unions joined together to create collective bargaining power by large groups of replaceable workers. The craft union model is wrong in several ways. It violates any sense of call: if someone has a charism for the ministry, the guild is not just unnecessary, it’s wrong. Second, If ministers are a member of guild then the congregations are simply purchasers of a service, exacerbating the tension between minister and congregation – the minister as plumber. The industrial union model also doesn’t match. Are ministers a large mass of powerless unskilled workers who have to combine to negotiate with the powerful congregations? Most knowledge workers are non unionized – they are not powerless. Both of these views lead down the road of requiring that all workers be union members – there is no real room for lay leadership. But the attitude that ministers need a union for power against congregations is recently recurring theme. This us-them attitude is not the road to success, and not how to run a religion. When I was in trouble 12 years ago the UUMA was anything but a supportive union. True, I was an intern, but their effort was too cult-like for me to appreciate. I had been to some of their meetings which were complaint sessions ramped up with high doses of paranoia. “They’re after me!” one minister said of her congregation. Another long-termer held forth on the Machiavellian way of ministry and how to beat those damn congregations into keeping you hired. No one was asssigned to me to help me as the bylaws called for and no one returned my calls or emails. All this after I’d gotten a “1” in Boston from the Fellowship Committee. Abandonment, gossip– some of it as mean as it gets — and shunning. That’s what I got from the UUMA. So the thought of the UUMA as a union? Yeah, that works for me, like Gotti and Capone. And, I know I was being a bit hyperbolic with the connection to unions… So let me be as clear as I can. I want the UUMA to not only educate and connect UU Ministers, but to advocate for them. That advocacy should not only be to the UUA, but to individual congregations on issues of fair compensation and benefits, ministerial expectations, and on why it is important for a congregation to ensure that their minister is both in Fellowship and is a UUMA member (regular or associate). “I am probably somewhat sensitive to this issue, in that I know that I, as a minister and Reserve Military Chaplain, am not covered by the U.S. Laws that protect other Reserve and National Guard soldiers from losing their jobs if they are called up for a deployment. The law does not require congregations to hold a ministry position for a military chaplain when they are deployed, nor does it prevent congregations from choosing not to offer or call military chaplains because of their military service. It is illegal for other employers to turn down someone because they serve in the reserves… but ministers are the exception. Jeff — I think that you are operating from a mis-understanding of Congregational Polity. Many have this understanding that Congregational Polity means that every congregation is independent, and should be able to make decisions independent of influence or pressure from anyone else. This is simply not true. Congregational Polity actually sets congregations as being Interdependent, not Independent. In other words, the system of congregational polity requires that the individual congregation be influenced and in relationship with, at a minimum other congregations… and in a healthy balance that the individual congregation be influenced and in relationship with every other aspect of our movement of religous liberalism. Congregational Polity, in my opinion, requires that there be a strong, organized ministerial presence in the system for the system of congregational polity to function in a balanced, connected, interdependent, and healthy way. Tom — I feel you have mischaracterized the “Union” movement. Simply put, in the dichotomy you create between “craft” unions and “Industrial” unions much of organized and collective barganing is left out. The glaring example, and one that I believe directly relates to what I am advocating for in the UUMA, is the Teacher’s Unions. There are others, including the unions of Public Sector Workers. I would state that there is a third catagory of “Professional” unions, that combine the educational and standards of a Professional Association with the advocacy of a Union. This is what I am advocating for the UUMA to add to its understanding of its role. I agree that neither of the models that you name would work for UU Ministry and how we “run our religion”… I just reject that the two models you name are the only models there are. Hi David, don’t worry about the delay in responding–I assumed that military duties were occupying you, and of course they should take precedence over blogging. More than once I myself have posted an essay sure to generate responses, followed immediately by life stepping in unexpectedly and preventing me from getting back online for some time. In your clarification, what you are describing does not sound like a union to me. It just sounds like a somewhat more activist UUMA. Unions–including teachers’ unions, to which several familymembers belong–operate by strict insider-outsider boundaries, the threat of sanctions, and dues-collection. They are otherwise unable to effectively carry out their business. I am in no way anti-union: I’ve seen the headaches they can sometimes cause and I’m well aware of the many benefits that they have brought to our society. I’m just in favor of being realistic about what unions really are before we go and possibly subject our religion to this model. In my opinion, it is your understanding of congregational polity that is inaccurate. Our churches are each independently-organized and operating institutions. We govern ourselves without interference from higher levels of religious hierarchy, which is the basic definition of congregational polity. This contrasts with presbyterian polity (the Presbyterians, United Church of Canada, etc), episcopal polity (the Anglicans, Methodists, etc), and so on. In turn, when it suits us, we freely enter into horizontal relationships with other independent congregations for mutual support. All Souls NYC has no power over Community Church of NYC, but they cooperate to the degree that they choose. 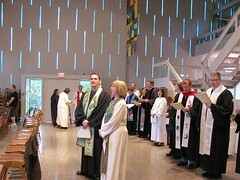 Sometimes these congregations enter into relationships with larger groupings of churches, such as the Unitarian Universalist Association of Congregations, the Benevolent Fraternity of Unitarian Churches, or the New York State Convention of Universalist Churches. Membership in such pan-congregational organizations confers certain benefits, and imposes certain responsibilities such as support through dues. But these para-church organizations have no direct governing power over individual congregations. Each congregation is in fact independent and self-governing, despite your representation above. I dispute your opinion that congregational polity requires a strong, organized ministry. Congregational polity does not require ministers whatsoever. Many congregations are happy not to have ministers and have never had them. Others cannot afford them, but nonetheless operate in a perfectly healthy manner. Let’s not forget our history, especially on the Universalist side: congregational polity preceded a strong, organized ministry, and operated just fine without it. These should not be taken as anti-minister, anti-UUA, or anti-interdependence remarks. Those are not my feelings. We are enriched by our relationships with each other and receive many benefits from our para-church organizations. But I think we should be clear on the reality of how our churches are governed and our actual responsibilities to one another. I don’t know enough of union history to say if Tom’s comments are accurate or not. But I think his comment about vocation is very important. Universalist and Unitarian churches have always called whom they will to serve themselves. This is vitally important for the spiritual health of a congregation, which knows better than an outside group what its own needs are. And the seminary-trained, fully-professional ministry is a later model, one that some of our best historic ministers did not operate under. I myself appreciate an educated ministry, but it’s hardly the only workable model in our churches. Your situation as a military reservist raises particular issues. I am sympathetic to your occupational uncertainty, not knowing if being called to duty will end up with you not having a regular pulpit to return to. That’s got to be tough, and I hope your congregation always does right by you. At the same time, in my opinion, it must remain legal and practical for UU congregations to reject ministers who serve the military. We have a strong, though by no means uncontested, history of pacificism, conscientious objection, and anti-militarism in our denomination. Some churches would not call or keep a minister with military ties because it would deeply violate their very sense of who and what a minister should be. The religious freedom of these churches must be safe-guarded and they must be free to choose alternate, non-military leaders. I can easily imagine a situation where most of a congregation does not know that the minister is a reservist. Then she gets called up, and is gone for some time. If the congregation refused to take her back simply because she’d been unavailable for some time, I wouldn’t support that. But if they refused her back because as a body they now fully realized that she was a member of the military, I would have to support them. That said, I do not feel that military chaplains are a violation of our religious principles. In fact, I think your work is highly important and I deeply respect your efforts. A UUMA or other organization that can speak clearly and strongly on behalf of ministers such as yourself–without having actual power to force or coerce congregations to act against their own religious principles–is something that would probably be beneficial. Currently, I don’t believe that a union is the solution. But you seem to have backed away from that model in your replies. I could not disagree more strongly with your characterization of Congregational Polity, at least as it is and should be practiced among Unitarian Universalists. Let me state my opinion on this as clearly as I can (realizing this should probably be a separate article in the coming days). If the “Independence-Centered” definition of Congregational Polity is the only possible understanding of Congregational Polity, then the UUAoC should abandon such polity as quickly and as rapidly as possible, as it is not only contrary to our values and principles but actively subversive to them. I believe that an “Independence-Centered” understanding of Congregational Polity is contrary to Unitarian Universalism, particularly to the Sixth and Seventh Principles. And, it leaves congregations accountable to no one when they violate any of the other principles of Unitarian Universalism. If the “Independence Centered” concept of Congregational Polity is the only possible understanding, then we need to remove the Sixth and Seventh Principles from our movement, and disestablish all connections with aspects of our Unitarian Universalist Faith Movement that are not congregationally centered. I do not believe our congregations should be understood as “Independent” congregations. Perhaps they were that before they chose to join the UUAoC. In doing so, congregations agreed to a set of By-laws and principles… and to being a part of a larger movement of Unitarian Universalism. They agreed to an understanding of the Universe that all things are Interdependent with one another. They agreed to be bound by some common sets of practices (by-laws, regular meetings, etc.). They agreed to be in relationship with other UU Congregations, and I believe they agreed to be in relationship and dialogue with the broader movement of Unitarian Universalism. I am not saying the UUA, or the UUMA, or even other congregations should be able to “over-rule” decisions of the local congregation. I am saying that UU Congregations, by joining in the larger movement and identifying as Unitarian Universalists agreed to be in Interdependent Relationship with that larger movement of Unitarian Universalism. As such, and being in such relationship, they should not expect the ability to make decisions in a vacuum of independence. We as Interdependent Congregations should expect that other aspects of our Liberal Faith Movement will be (and should be) in regular dialogue with each congregation about the decisions they make, how they reflect our stated and shared values and principles, and what they say about the overall movement of Unitarian Universalists. I will state this as clearly as I can, and I know my doing so will be controversial. If a congregation wants complete independence to make whatever decisions they want outside of any influence or relationship with the broader movement of Unitarian Universalism… then I would recommend they seek that independence outside of the bounds of our Interdependent Movement. Either that, or we take the Sixth and the Seventh Principle out of the Charter that those congregations agreed to when they accepted membership in the Association (and movement) in the first place. You gave me an example based upon military service and ministers. I disagree with that example. Not in that congregations can make such a decision, because they certainly can… but in the implication that “respecting” that decision means that the larger movement does not challenge such a decision. I believe that in this case the larger movement of Unitarian Universalism should indeed challenge any congregation that makes such a decision to look at our shared values. To encourage them to a greater understanding of military ministry. To ask them to look at what pre-conceptions and prejudices might have influenced their decision… and to continually call them back to revisit that decision on a regular basis. I believe that work of challenging a decision by one of our congregations that groups may feel are contrary to our shared values and beliefs is the work of the UUA, UUMA, UUSC, other congregations, and even whatever minority might be within that particular congregation. Of course the congregation gets to make that decision, and of course the movement as a whole should seek to stay in conversation and relationship with that congregation about that decision. To do anything else is conflict-avoidant and an unhealthy religious relationship dynamic. Let me give you an example of my own. UU Congregations have for years made decisions about our ministries and our pulpits that have been prejudicial to people and ministers of color. I believe that such decisions have been contrary to our values and beliefs, and there are large numbers of ministers and other institutions within our faith movement who have come to similar assessments about our congregations. Organizations such as DRUUMM and the UUA Ministry and Professional Leadership Office (or whatever it is called now) have moved into relationship to challenge, advocate, and influence congregations around such decisions. I believe that such advocacy is inherently necessary in order to practice Congregational Polity in ways that are in line and in-tune with our stated values and beliefs as Unitarian Universalists. Similar work has happened and continues to happen around Women in ministry, around GLBTQ persons in ministry, and so much more. I want to answer what I think is a Strawman Argument in both of your posts… in that at no point did I advocate any coercive measures. I did not in the earlier posts or in this one state that any congregation should be removed from the UUAoC, or that any other coercive action should be taken. I may appear to have “backed off” such a stance… simply because it was never part of my position in the first place. I have argued for nothing but advocacy, influence, and for congregations to realize that in an Interdependent system they do not make their decisions in a vacuum. I stated in this post something I do believe… that if a congregation wants complete independence in their decision making, that is contrary to my understanding of our UUA Principles, (which they agreed to when they joined the association), and they should consider leaving the association in order to have that complete independence. And in answer to your point about lay-led congregations, I spent many years in a lay-led congregation, and have preached in dozens more. I think you are idealizing them quite a bit. I believe such advocacy, influence, and challenge are non-coercive, and are a necessary and vital part of our UU practice of Congregational Polity. Without it, Congregational Polity becomes far too “Independence-Centered” to be a functional system within our stated values and beliefs. For we are not an Independent Religious Faith Movement, but an Interdependent Religious Faith Movement… and that does, and should include our concept of Congregational Polity. David, we should be clear that UUism has no Principles. Those principles you cite, such as the sixth and seventh principles, are the guiding principles of one particular organization, the Unitarian Universalist Association of Congregations, as embedded in their bylaws. Those bylaws apply to no other organization. Individual congregations or persons may choose to take up those principles for themselves, but that is an individually-willed choice, one that is not beholden on other churches or people. There are many UUs who disagree with some of the UUA’s principles, and they are no less UU for doing so. Here in Canada, we are not part of the UUA, though some of our churches have independently chosen to affiliate with the UUA (mine is one). We are members of the Canadian Unitarian Council, a separate organization that has separate bylaws. The CUC has decided to affirm the current wording of the UUA principles, but is under no obligation to do so. Congregations are not accountable to anyone else when they violate the Sixth or Seventh Principles, because those are the Principles of a separate organization, the UUA. They are only in violation if they themselves as specific congregations have voted democratically to apply such principles to themselves. Some churches include these principles in their own bylaws and/or liturgy, while others do not. My church does include them in our bylaws, which is fine by me, because I happen to support these principles. The UUA may decide that an affiliated congregation is in violation of those principles, and decide to withhold their services from such a congregation. But they can take no further action against a congregation because, due to congregational polity, each church, even if a member of the UUA, is entirely independent and self-governing. That’s what congregational polity is: the complete governing independence of each individual congregation. The UUA is an organization established to assist these various independent congregations. It does not govern UU life–note for example, that individuals cannot become direct members of the UUA. The majority of UUs in North America are not affiliated with the UUA even indirectly through congregations, since a slight majority of UUs are not members of an affiliated congregation. The UUA exists to provide our congregations with services. That is its absolutely explicit goal. It has no governance ability. It may be use to note that the seventh principle of the UUA bylaws was only added in 1985, with substantial opposition from many quarters. Further amendments have been proposed and defeated. Many people try to turn the Principles of the UUA bylaws into a de facto creed of UUism. It is this which is a betrayal of our historic Unitarian and Universalist religiosity. We are creedless, in fact and in spirit. UUs who do not believe in the inherent worth and dignity of _every_ person are just as much UUs as those of us who do. I say this as someone who fully embraces the inherent worth and dignity of all others. I’m glad that you never envisioned coercion by the UUMA. But my reaction was a natural one, one you’ll find from many people whenever you raise the idea of unionizing ministers. Unions use coercion to accomplish their goals. That’s what they do. I say this as someone who works with unions, has union-member familymembers, and supports the role of unions on our society. What we saw in Wisconsin was, in my opinion, a tragedy. In the end, I think we may be talking past each other a bit because we’re using different perspectives based on separate concerns. I fully appreciate that we are interdependent with other congregations (and the whole universe, in fact), and we enter into covenants with one another, undertaken by our own free choice and binding on us only to the degree that our conscience moves us (and I hope that it does). But that doesn’t change the fact that each congregation is the sole governor of its affairs, or the fact that UUs are not required to affirm _any_ set of principles in order to be members of this religion. I support advocacy on behalf of ministers, so long as it does not lead to a) actual interference in the governing of each individual congregation or b) imposition of creedal tests upon congregations or, especially, individuals. It is pretty clear to me that we have a fundamental disagreement about the nature of the UUAoC bylaws… (I moderated this piece of my own writing, becasue I was being snippy and I had no business being so… Jeff has been wonderful throughout this conversation and I was mad at my cat when I was typing… sorry Jeff). Congregations had to affirm that covenant to be members of the UUAoC. If they do not believe that they are bound by that covenant (as congregations, not as individuals) then they should not be a part of the UUAoC. It does not get more clear than that, my friend. In light of your recent post… I agree. We have a fundamental disagreement as to the nature of Unitarian Universalism. I believe the opinion you express is a minority opinion, and you are of course welcome to hold it. As you say, revisions to the bylaws in tune with the values you are expressing have been defeated at the GA several times. I do believe that congregations are bound by the covenants they make, and that the principle of Interdependence should be the guiding force behind our Congregational Polity, not the principle of Independnece. I also do not believe that Congregational Polity Purity should be “the hill we choose to die on” as a religious movement. Yet, I’m willing to cede that there are indeed those who believe otherwise, and are able to do so in love. Because if we agree in love, as the old phrase goes, nothing can do us any injury. That agreement in love is the purpose of the covenant we make with one another. UU’s are not required to affirm any principles to be members of the religion… but congregations are required to affirm principles to be members of the UUAoC. No where in this discussion are we talking about individual UU’s… only about congregations. I agree that the principles are not creed for individuals… yet that does not take away that they are a Covenant for congregations. The irony, of course, is that as Buddhist interdependence is the core of my religious vision, and as a Universalist the loving kinship of the entire human family is my guiding spiritual principle. I just don’t think they translate to the actual power dynamics within and between UU institutions in the same way you do. I’ll look forward to going a few more rounds with you on the next post when it comes about. Till then, take care, be well.